Westin Hotels & Resorts, part of Starwood Hotels & Resorts Worldwide, Inc. (NYSE: HOT), today announced that the highly-anticipated Westin Nashville will open its doors this Fall 2016 in the city's vibrant downtown district. Owned and developed by Castlerock Asset Management LLC and managed by Wischermann Partners, Inc., The Westin Nashville is a newly built hotel located adjacent to Music City Center, the city's new convention center. "With Nashville's booming tourist economy, we are thrilled to introduce a unique wellness proposition for business and leisure travelers, as only Westin can," said Bob Jacobs, Vice President of Brand Management, North America, Westin Hotels & Resorts. "From our iconic Heavenly Bed to our Gear Lending partnership with New Balance, we look forward to having guests leave The Westin Nashville feeling better than when they arrived." "We are very pleased to join the hospitality community in Nashville," said Paul Wischermann, President & CEO of Wischermann Partners. "The entertainment and music industry has created an international draw to this city, which is unlike any other destination in the United States. We are committed to building a long-lasting relationship with the city, its business community and its residents." The Westin Nashville will feature 454 design-led guestrooms and suites, drawing inspiration from the vibrancy of the city while promoting a sense of well-being. Designed by The David Mexico Design Group, in association with Bullock Smith and Partners, all guestrooms and suites will feature the world-renowned Westin Heavenly® Bed, featuring lush sheets, down cushioning and a patented pillow-top mattress. Furthering the brand's commitment to guests' well-being, The Spa at The Westin Nashville will boast nine treatment rooms, an idyllic relaxation room and a full menu of signature treatments, including body treatments, massages and facials. The Westin Nashville will offer two signature restaurants in addition to Nashville's premier rooftop venue, offering hotel guests and locals unbeatable views of downtown Nashville with a dynamic rooftop pool experience, a creative food and craft beverage program and daily live entertainment. The hotel will also feature 20,000 square feet of state-of-the-art meeting space in addition to private space in the rooftop venue for discerning planners, who are looking to host events that bring the best of the destination to life. 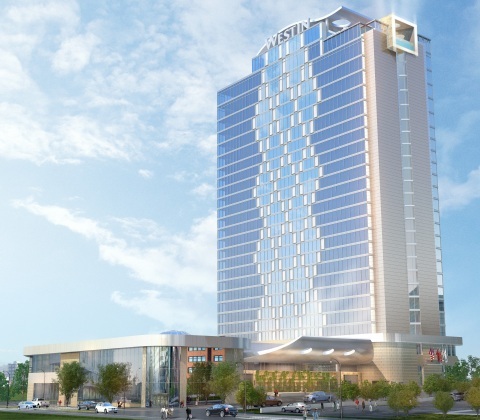 "We are truly excited to see this highly anticipated project come to life later this year," said Ray Waters, General Manager of The Westin Nashville. "We are building a world class team whose focus will be on creating memorable experiences for our guests who are discovering the great city of Nashville." Located at 807 Clark Place, The Westin Nashville is walking distance to Nashville's vibrant entertainment district, South Broadway, as well as Bridgestone Arena, Ryman Auditorium and the Country Music Hall of Fame. Other nearby attractions include the Tennessee Performing Arts Center, Frist Center for the Visual Arts and The Grand Ole Opry. For more information, please visit www.westin.com. Castlerock is an Owner, Developer and Asset Manager that focuses on hospitality and residential real estate. Through its principals, it has developed hotel and residential developments from New York, London, Dublin and Warsaw with a combined value in excess of $2.5 billion. Castlerock is focused on adding value through acquisition, design, development and the management of real estate. This allows Castlerock to maximize value through the entire development cycle by delivering innovative and quality investments.